Hi all you fabulous crafter's out there! Today I am using a lovely image from All Dressed Up Stamps for the Outlawz Progressive/Freebie Challenge. This card represents a new beginning in a new year that will be my mom's first as a breast cancer survivor! What a great beginning ! And for those of you not checking yourself and protecting your self with early detection practices....Please make this the year you faithfully begin doing so! We are so worth fighting for and we have to help the war by staying as healthy as we can. Go now and mark on your calendar what day of each month you are going to do your self -exam, and if you are old enough mark October for super deals on a mammogram! Ok, I will stop preaching and give the detail and a little info on the Outlawz! The Outlawz Progressive Challenge begins with joining the group and upon being approved go to this challenge (they have sooo many challenges!) and send and email to the given person and you will receive a lovely image! After completing and entering your creation, the next and the next month you will receive another fab image from many different stamp company's! How cool is that? I mention deets and here they are..finally! I colored the image with Bic Mark It's, fussy cut, and glued on to blue card stock for stability ( I ran out of white card stock and had to print her on copy paper...bad idea!) The base is the same blue paper, the a slightly smaller piece of white with the blue vellum cut and attached the same size as the white. I adhered 2 piece of ribbon on the blue background piece before adhering the white/vellum piece. The I used a dollar store paper doily heart and glued it. I cut a blue heart with white wings from my Cricut from the Hello Kitty cartridge and inked the wings with a light blue that I had in my stash; I inked everything with this same blue ink pad. I adhered the image to the right side, overlapping the wings of the heart over her hat. I used the reverse image left from my Cricut cutting the sentiment and used that as a stencil to make my sentiment with a pink Promarker. I had some Breast Cancer pink ribbon stickers in my stash that I used as well as a pretty blue snow one that I used. The bling was on sale in the Christmas stuff this week at Dollar General and I loved them. The challenge at Country View Crafts was to "Use Something New to You" and the odd pink flower on the bottom is the result of a failed experiment of my mom's and mine. We tried melting colored plastic shot glassed for sun catchers but they were too thick and would only melt to this stage. One person's disappointment became our lovely pink flower! A new technique with a twist! 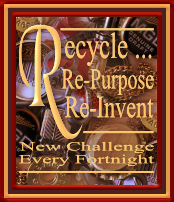 For the Mixed Media Mojo challenge the theme is New/ with a twist of 15. This is my first challenge with them so I am taking the twist of 15 not literally the number of 15, I am using 15 objects on the page to embellish that to me are Breast Cancer Awareness Survivor meaningful. They are: pink flower, 7 clear blings, 2 pink blings, pink heart ribbon sticker, the "strength" sentiment, and the 3 beads on the stick pin ( which is also a new thing for me this being my first ever to make! So love yourself and your family and celebrate staying healthy as we are celebrating my mom's victory over breast cancer! To many new beginnings for us all! Tip for Tip Top Tuesday: Take small colored plastic shot glasses and put on a metal pan (do not use for cooking after using for plastic!! don't do it!) and put in a pre-heated oven around 325 degrees and watch until they crumple. Then you have a lovely blob and I put 2 together to make my pink flower. Easy Peasy! Oddball Art Challenge "Add Some Sparkle"
Thanks for sharing your card with us this time at Top Tip Tuesday. What a great way to get the word out to all us fabulous women to check yourself each month! You go girl!! Wonderful card!!! Thanks for joining us at the Sisterhood of Snarky Stampers! well done, . Thanks for joining us at Sisterhood of Snarky Stampers. Another fantastic project Nanette! You've been a busy crafter! I love that your projects vary from seriously cute and cuddly to immensely creepy and they are ALL awesome! Thanks for joining the sisterhood of snarky stampers (again) for our "W is for WOW it's Cold" challenge!!! So glad you had time to play. I learn so much from you, melting plastic shot glasses? That sounds fun! Love your play with 15 and celebrating the New Year. Love your colors and sweet image! So fun! 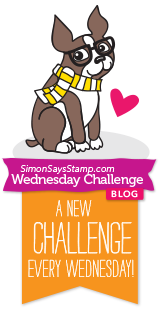 Thanks for sharing your card with us this week for the Simon Says Stamp Monday Challenge. We are so happy to be a part of your celebration. So happy for your family! Thanks again! An important message, and a terrific way to spread it with this sweet card! Thanks for joining the fun at the Sisterhood of Snarky Stampers! Thanks so much for joining us at Mixed Media Mojo! Love all the blue and that cute image! I had some Breast Cancer pink ribbon stickers in my stash that I used as well as a pretty blue snow one that I used.